Travelling though the night from Anderston to Arvagh, Co.Cavan, can fairly take it out of even the most dedicated athlete. This group of under 14s took the opportunity of the traditional ninety minute delay before the start of the feile parade in Cavan town to grab forty winks. So what were they dreaming about ? All-Ireland glory? If they would get to Burger King after the game? Who knows? But there is a size four club training ball for the best suggsestion. E-mail tom@conaill.fsnet.co.uk with your entry. This competition will be judged by retiired auctioneer Jim 'Sporty' Roarty. Deadline is 21st March. "Like father, like son. 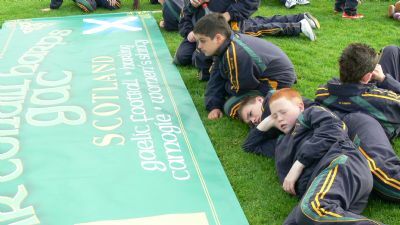 Always sleeping on the job"
Hilda Dooley is more known for her prowess with a caman in her hand, doing battle on the camogie and shinty fields of Scotland and Ireland. 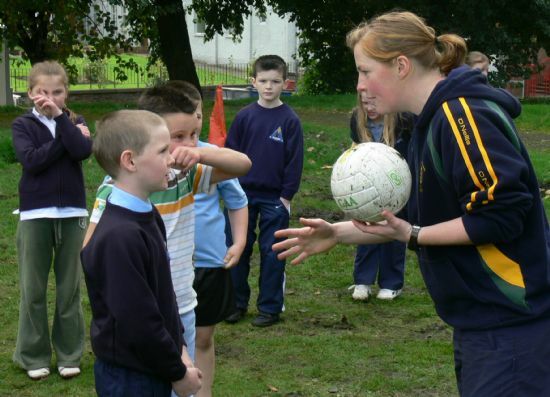 However, the mild mannered colleen showed her versatility at the recent feile na mBan, where she performed a cameo role as a football coach at a session for schoolchildren at Glenconner Park, Royston. What words of wisdom did the soft spoken and petite country girl impart on these impressionable young students? Perhaps, more interesting is how did these streetwise sons and daughters of Garngad respond? You tell me! A prize of a Tir Conaill Harps training top will be yours if you are the author of the best caption. This competition will be judged by former club chairman, Ian Robertson. Deadline for entries is 20th January, 2009. 2. The Police clamp down on drugs in sport with the introduction of trained sniffer children. 3. "Hawl missus, stoap talking a load a mince and gies the baw!"